Specimen preparation for conducting tests with the Taber® Abraser (Abrader) is dependent on the material being evaluated. For repeatable and reproducible results, standard laboratory practices should be followed. Most flexible materials can be cut to size using the Taber® Sample Cutter - Model 5000. Manually operated, this bench top cutter uses an industrial cutting blade to prepare an exact 107 mm diameter specimen. 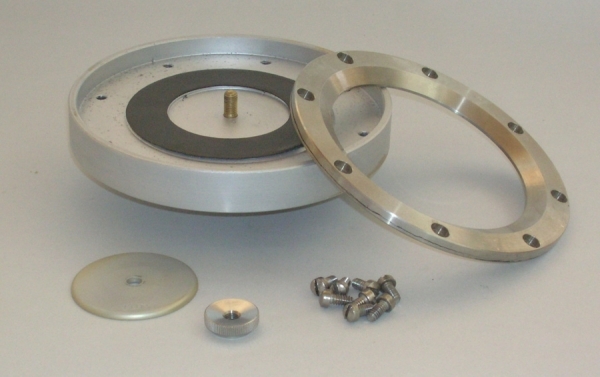 A punch lever evenly transfers force through a spring-loaded clutch to punch a 6.35 mm center hole. 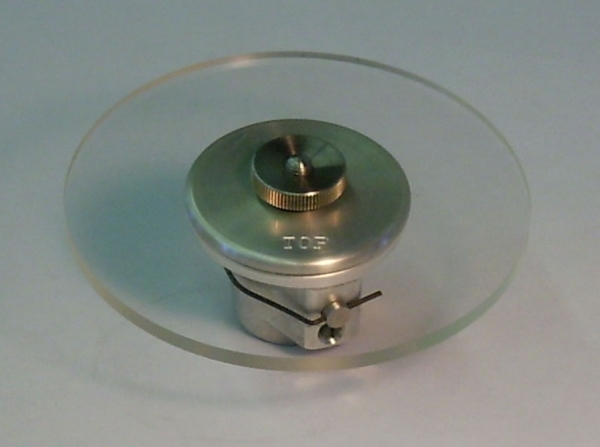 To prevent stretching or wrinkling of the specimen during testing, flexible materials can be mounted to the S-36 Square Mounting Card or S-36-1 Round Mounting Card. To prevent the vacuum from lifting the specimen, it is advised to use the clamp ring. Textile materials may also be prepared using scissors with an approximate size of 135 mm round or square. To cut the center hole, fold the sample twice and cut a small portion of the resulting corner. 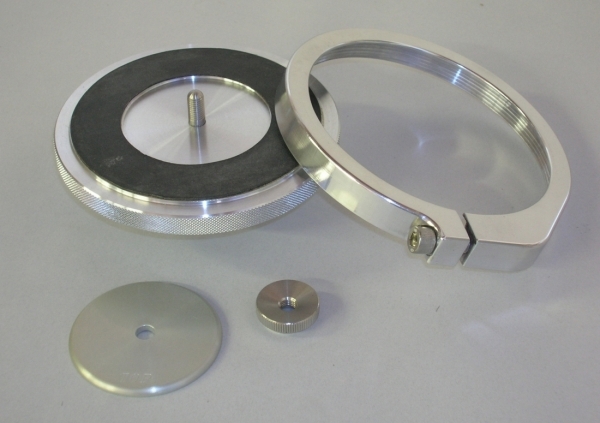 Flexible materials are normally mounted on the standard specimen holder with the clamp ring. The E100-101 Specimen Clamp will accommodate flexible materials up to 0.79 mm thick. The E100-102 Specimen Clamp will accommodate flexible materials up to 1.59 mm thick. To generate useful data, specimens must not be stretched or wrinkled. 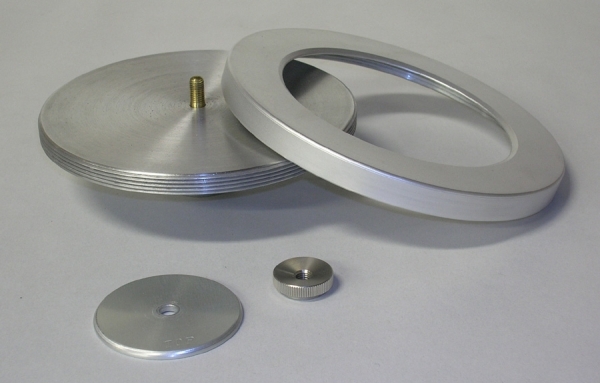 A Textile Specimen Holder (E140-15) has a raised wear track to give the fabric extra tension when the ring is drawn down over the edge of the holder and the clamp plate is drawn down into the center recess. 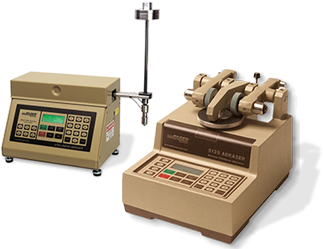 To subject specimens to a wet abrasion test, the Textile Holder, Tensioning Type for Wet or Dry Testing (E140-18) can be used. This holder is designed to give an initial tension to woven fabrics to minimize wrinkling so that they may be tested while moist. A Transparent Table (E100-10) may be used for viewing textile specimens against a strong light to determine the worn condition of the threads without removing the fabric from the holder. The E100-10 can also be used with a small, high intensity light bulb located beneath the specimen holder which activates a photocell and electronic relay to turn off the Abraser when the established wear point is reached. Rigid specimens are often cut from a larger sheet utilizing a cutting method appropriate for that material. 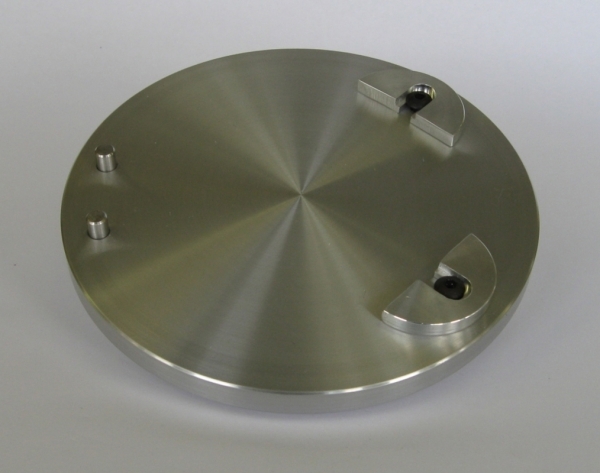 A 100 mm square sample is recommended with a 6.5 mm center hole. The recommended specimen thickness is 6.5 mm. Using the S-21 Extension Nut, specimens up to 12.7 mm in thickness can be evaluated (9.5mm center hole is required). 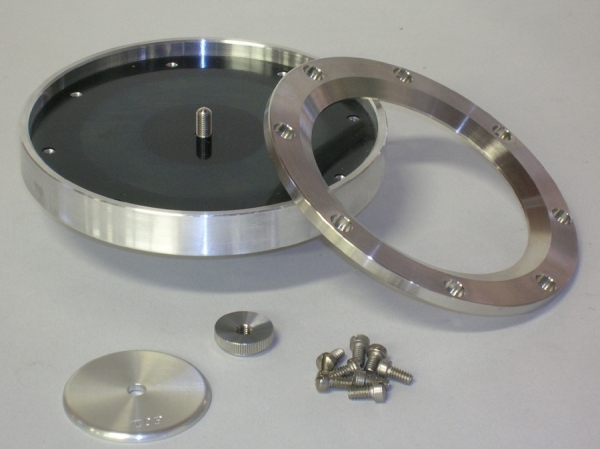 The Arm Height Extension modification will permit testing up to 40 mm in thickness (13mm center hole is required). When preparing rigid specimens, ensure the top and bottom surfaces are flat and parallel. Rigid materials are generally mounted to the standard specimen holder without the Clamp Ring (E100-102), and require a 6.35 mm center hole. 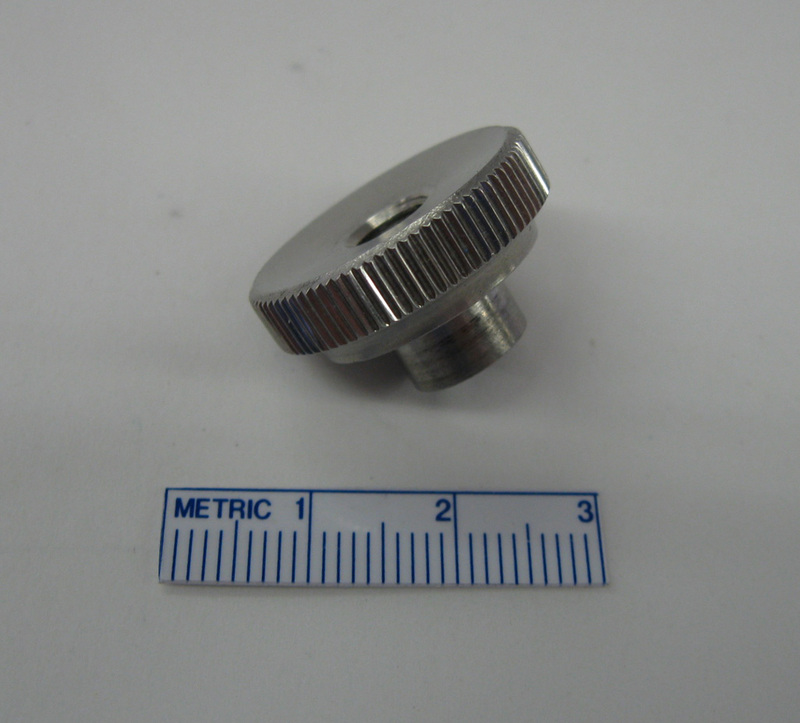 For material thickness that requires the S-21 Extension Nut, a 9.525 mm center hole is required. 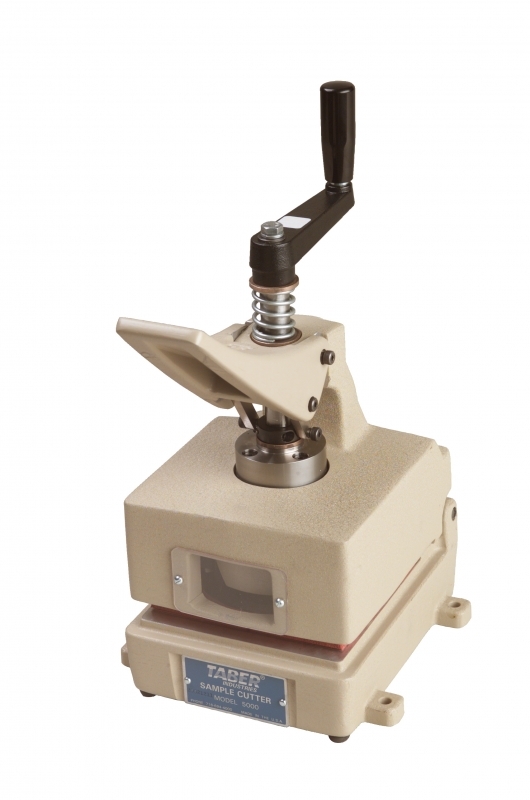 It is possible to test specimens without a center hole by using the Drive Pin Type Holder (E140-19). Specimens of uneven thickness should be shimmed so that the top surface runs true. A Ring Clamp Specimen Holder (E140-14) or Threaded Ring Specimen Holder (E140-21) can be used to test materials that are slightly warped. 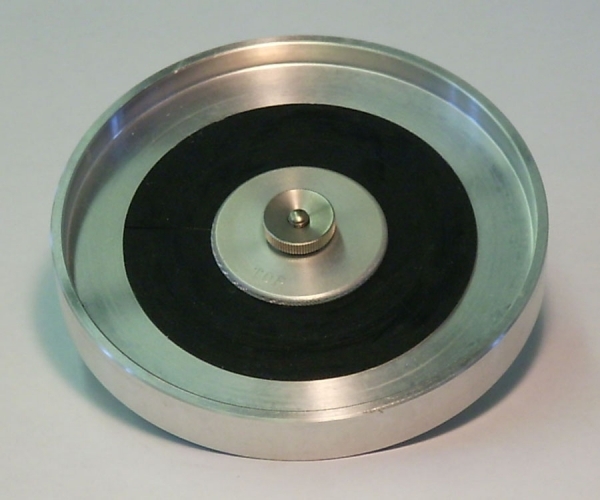 To subject specimens to a wet abrasion test, the Rimmed Specimen Holder (E140-75) can be used. This is useful to determine the effect of absorbed and / or surface moisture on abrasion resistance. Specimens should be cleaned in such a way that the surface is free from grit, grease, fingerprints or other contaminants. Since many different kinds of materials can be tested with the Taber Abraser (Abrader), a specific cleaning treatment cannot be given. If contact with solvents or cleansers result in changes to the material properties, surfaces might be cleaned with isopropyl alcohol or a soft cloth. Prior to testing, it is recommended that specimens be conditioned for at least 24 hours in the test atmosphere. Organic materials should be conditioned for 48 hours. The drying and curing conditions for printing or coating on plastics versus metals can be different and may influence the test results. Cure these specimens under conditions specific to the material. Also, heat and moisture are known to affect the physical properties of many materials. It is recommended that all tests be conducted in the standard laboratory atmosphere of 23 ±2°C with 50 ±5% relative humidity.